Early identification of the disorder remains a major challenge as many children access services much beyond six years. Our indigenously developed program yields excellent results when intervention is initiated early. Asha knew something wasn’t right with her son. Aryan, Asha’s son wouldn’t speak much. He barely slept. He used to not respond to his name or the fanciest remote controlled car his father bought him. When consulted, their family doctor in Kerala, laughed it away blaming it on the ‘terrible twos’- a stormy development period that all kids go through. ‘Wait till he’s five’, the doctor said. Fortunately for this family, it just took one more year and a move to Bangalore to figure out what the issue is. Aryan was diagnosed with Autism. Autism is a neurobiological condition that persists through the lifespan of an individual and is characterized by difficulties with communication, social interaction and repetitive motor movements. Aryan was diagnosed early and now he is studying in class 8 of a regular school. Sadly, that is not the case for millions of children across India. Seeing that the incidence of Autism is growing at alarming proportions in the world, i.e. over 1 in 88 individuals, awareness is the need of the hour. The fact is that there is no medical cure for this condition and no one knows why it happens. 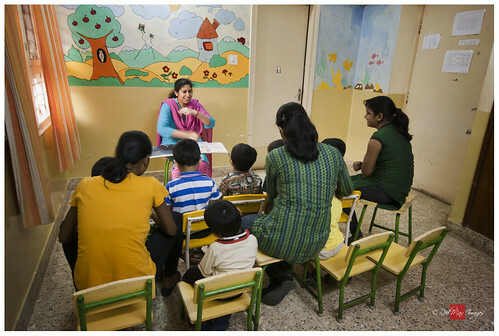 And as of now, intensive early intervention is observed to be the most promising approach providing best long term effects for these children. The Communication DEALL (Developmental Eclectic Approach to Language Learning) is an early intervention program for children with developmental language disorders like Autism Spectrum Disorder. Our individualized program - DEALL - provides motor, social, emotional, cognitive and communication training. It delivers intensive stimulation, that is 3 hours a day for an academic year by a diverse team of speech language pathologists, occupational therapists, developmental psychologists and educators with a 1:4 staff to student ratio. 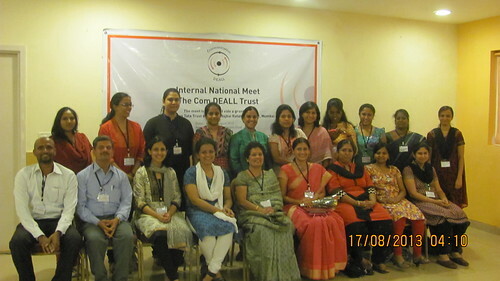 Our program is supported by ComDeall trust, with its Head Office in Bangalore. The trust is deeply committed to provide children on the Autism Spectrum every opportunity to develop their full potential and join the mainstream. We have realized with our experience that with intensive early intervention children with Autism can grow up to be contributing members of society and we strive for it everyday. We do awareness activities and set up clinical services across the country. We also train individuals and engage in research. 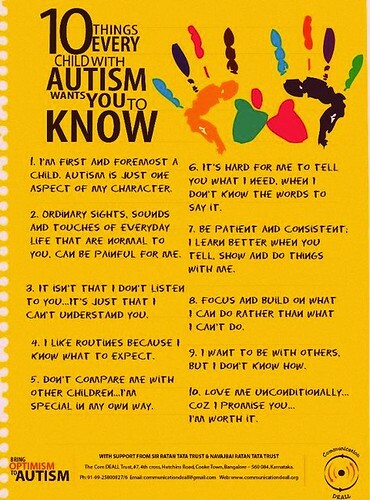 We seek the help of people in the community to create awareness about Autism. Help us reach out to more people. Talk to young parents, school teachers, general physicians and pediatricians. Without treatment, the condition only worsens and brings not only the child but the entire family down. So, spread the word! We need your help to design sensory toys and games for the children we serve. What are they? Read on, carefully..
Children with Autism have difficulties in processing everyday sensory information such as everyday sounds, sights and smells. They can be both oversensitive and/or under sensitive to sensory inputs. For example, a child who is over sensitive to touch may constantly shy away from being hugged while a child who is under sensitive to sights may seek bright colored objects. If the sensory needs of a child could be incorporated into games, they would not only satisfy the child’s needs but also motivate the child to stay engaged with people and stay involved. Our challenge to you is to pick one sense from touch, sight, hearing, taste, and smell or a sense of movement and balance. You have to share an idea to invent or modify an existing game or toy around your chosen sense to satisfy the sensory need of a child with Autism. Make a point to design the game in a way that it could be put together easily using material available in people’s homes.